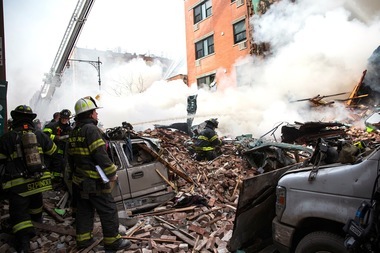 Firefighters respond to a five-alarm fire and building collapse at 1646 Park Ave. in Harlem March 12, 2014. MANHATTAN — Hundreds of Con Edison workers had to be retrained after it was found that they were unable to properly connect natural gas pipelines, The New York Times reported Thursday. But utility company officials said Con Ed is fixing the problem and insists worker error had nothing to do with the deadly East Harlem explosion that killed eight people and injured dozens more, a spokesman said. The Times story revealed that 301 workers who connect sections of gas main lines as part of their jobs did not have up-to-date qualifications. Con Edison retested the workers, who install plastic pipes that carry natural gas to city buildings. Of these, 62 failed and needed to be retrained, the Times found. “We are confident that these requalification lapses did not compromise the integrity of our gas system. All of the plastic gas piping joints and connections in our system are physically pressure tested at the time of installation to ensure pipe integrity,” Con Edison said in a statement. The National Transportation Safety Board is still investigating and has yet to issue its final report. A preliminary report into the explosion of two buildings on Park Avenue between 116th and 117th streets on March 12 found small gas leaks in a more-than century-old cast iron pipe beneath pavement and a cracked water main near the pipe. An 8-inch plastic pipe was installed in 2011 to replace a section of the cast iron pipe.